ARCHANGELS is a company based in God's Country (beautiful sunny Southern California), dealing in Rare and Unique Paper Collectibles. We specialize in vintage Comic Books, Original Comic Book Artwork, Hollywood Movie Posters and other related items as well. We are Senior Advisors to the Overstreet Comic Book Price Guide and a Charter Member Dealer with the Comics Guaranty, LLC (CGC). For other wonderful items, make sure to visit us at our About Me Page. 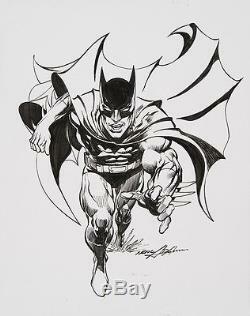 Batman Specialty Art by Neal Adams. This beautiful full figure Batman specialty piece was illustrated by the living legend himself, Neal Adams. In the late 1960's and early 1970's, Adams was a young artist of extraordinary talent and extraordinary vision who executed the unorthodox idea of returning Batman back to the night, just as Bob Kane and Bill Finger had originally envisioned the character way, way back in May of 1939. Adam's dramatic and realistic illustrative style was absolutely perfect for the dread Batman, and Bob Haney and Denny O'Neil were hired to script the unforgettable stories that were published in Brave and the Bold, Batman and Detective Comics. This trio of super-talents were ideal to bring Batman back to his roots - the grim glory of his inception and the gritty reality of the mean streets of Gotham City. Haney, O'Neil and Adams literally made history here, cementing their legends in the Batman mythos with unforgettable stories of such magnitude and influence, that they are celebrated to this very day. Bob Kane and Bill Finger created Batman, but Neal Adams saved Batman from the doldrums of apathetic extinction - the right man at the right time! To own a piece of Neal Adams original artwork is to own a piece of comic book history by one of the greatest talents to ever grace the medium. Done in pen and ink on 11" x 14" illustration paper. The item "Batman Specialty Art by Neal Adams" is in sale since Monday, January 16, 2017.